Here we go over using widgets with Fresh Profit Pro and how to setup the fully widgetized homepage option. Learn where the various widget areas are and how to activate the static front page for your site. Most users specify a page called “Home” for their frontpage and then use another page called “Blog” to be their blog archive page. When you activated Fresh Profit Pro, these pages were created for you if they did not already exist. So you are ready to go to Appearance => Customize => Static Front Page. 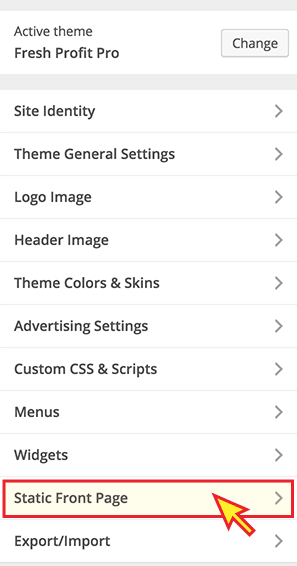 Choose the radio button for A static page, and then choose “Home” for the Front page and “Blog” for the posts page. 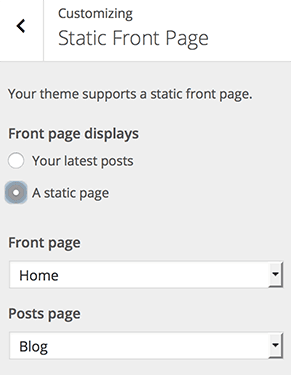 You have now completed the guide for setting up a Static Front Page and using Widgets. Please see the main Fresh Profit Pro WP Theme Documentation guide for links to additional training articles.